"Forget one by one the everyday sounds, all these noises, all these symbols of a life that has become modern, urban. Forget this glass-and-metal environment. Welcome to the world of Atlantis. The original world." In 1988, French director Luc Besson released his emotional epic about deep sea divers, The Big Blue, to international acclaim and American indifference (due perhaps in large part to the re-edited U.S. cut, which was 45 minutes shorter and featured a different score). Though I enjoyed the uncut version (released on DVD by Columbia TriStar), I found its thematic waters a little murky. The only concrete message I walked away with was that Besson has a passion for the ocean, and a belief that there is tranquility and peace to be found under the waves. Atlantis, released in 1991, is an extension of those themes. It was filmed all over the world, from the Galapagos Islands to the waters near Hawaii, by divers working with sophisticated underwater cameras that allow for crisp, high quality photography the likes of which is rarely seen in low-budget nature documentaries. Presented without characters, dialogue, narration, or dramatic structure, it is less a documentary than a 77-minute visual poem, enhanced by the music of frequent Besson collaborator Eric Serra. The only speech is an overwrought opening monologue that asserts that man once existed as a "prince of the sea" and that all he is�love, hate, spirit, light�came from the depths. The camera plunges beneath the surface and then seems to wander aimlessly from one subject to another, ostensibly following the themes of different "movements" that appear onscreen. Serra's music is a mixed bag. Sometimes his electronic soundscapes mix well with the action; other times, they feel out of place or distracting. His attempts to be humorous feel instead dated, and I wish he had shown more restraint throughout. In "The Light," the bubbles formed with the crash of each wave are transformed by the sunlight streaming down into millions of tiny shooting stars ricocheting off the lens of the camera. In "The Spirit," a pod of dolphins swims alongside the camera, and it almost seems as if they are aware they are being filmed as they spin, flip, and race after one another. In "The Movement," the journeys of a slinky sea serpent are accompanied by a rhythmic Middle Eastern riff from Serra, and though it works, it was the first instance of the music really drawing attention to itself. "The Game" follows a herd of seals playing a remarkable imitation of tag. "The Grace" (which begins with a humorous visual of a school of fish exploding apart to the ringing of a classroom bell) is the most moving section, the ethereal gliding of the manta ray accompanied by a haunting, operatic performance of La Sonnambula by Maria Callas. "The Night" explores the different creatures that emerge once darkness falls (including some phosphorescent critters that are positively alien). "The Tenderness" is also affecting, as it follows two mournful-looking manatees as they float together through clouds of swarming fish, looking for food and feeding each other. They stare into the camera and hold their big flippers like they are asking for a hug, and there is another bit of humor when one of them bumps into the lens, followed by a shot of the other holding a flipper to its mouth in an unmistakably human "oh no!" gesture. "The Love" is made up of footage of sea creatures mating, from turtles clinging together to snakes twisting around one another, and a section that's already a bit too on-the-nose is made worse by the embarrassing bit of euro pop on the soundtrack (easily Serra's most egregious lapse in judgment). "The Hatred" cleanses the palate with footage of a shiver of sharks on the prowl. Finally, in "The Birth," we emerge from the water, and look down on it from an immense height. A speedboat zooms by. The teeming sub aquatic world has passed away, and we are once again in the domain of man. The film is trying to argue that the two aren't so different, but it's also clear which is more mysterious, more enchanting. 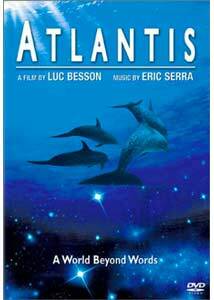 I'm not sure that Atlantis makes an argument or successfully transmits a message, but Besson has nevertheless produced a meditative artistic statement, a real-world Fantasia that is frequently startlingly beautiful. Image Transfer Review: Atlantis has received a much better transfer that its sister film, The Big Blue. While the latter looked grainy and suffered from some print damage, Atlantis is absolutely gorgeous. The rich variety of blues in the color palette comes across with no apparent loss of detail. Images are crisp and lifelike. Blacks are deep, and shadow detail is excellent. I noticed no grain or print damage, and zero instances of artifacting, edge enhancement, or aliasing. This is easily one of the best live-action transfers I've seen in a while. Audio Transfer Review: The audio is presented in the original 2.0 French, but the language doesn't make much of a difference, as the only speech in the film is the few lines of opening narration. Eric Serra's score is spread nicely across all the channels, presented with a full, rich sound and excellent fidelity. The surround come into play frequently, enhancing the music or contributing atmospheric effects (like the laughter of children playing in chapter five, "The Game"). The only enhancement 5.1 could offer would be more pronounced LFE, but the mix sounds very good without it. Extras Review: The only proper extra is the unique theatrical trailer, which starts on a helicopter and follows the cameraman as he dives into the ocean, illustrating well the film's themes of the hidden world of the sea. There's also a clip for Besson's most recent directorial effort, The Messenger: The Story of Joan of Arc. English subtitles are provided for the opening narration, but sadly, not for the intertitles which announce each "movement" of the film (though they are properly translated on the scene selection menu and on the chapter insert), nor for the closing credits, which introduce the "cast" of animal characters in French. Atlantis is an odd sort of film. Though beautifully shot and at times hauntingly scored, it never makes much of a point beyond a simple illustration of the enormity and majesty of the underwater world. Columbia TriStar's DVD is top-notch, though, and will please fans.